I know you're all very very confused, and no, today's definitely not Tuesday. 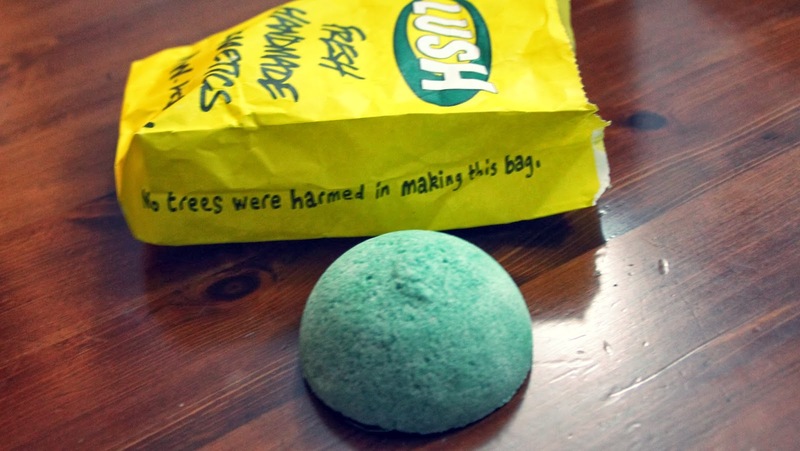 But, recently I've been going to Lush quite a lot, and i just wanted to show you what i got, before it all ends up on my face or in the bathroom sink. Just a small disclaimer: for all you Balistic and Bath bombs lovers out there, you won't find any in this Haul. The reason is, I don't have a Bath! 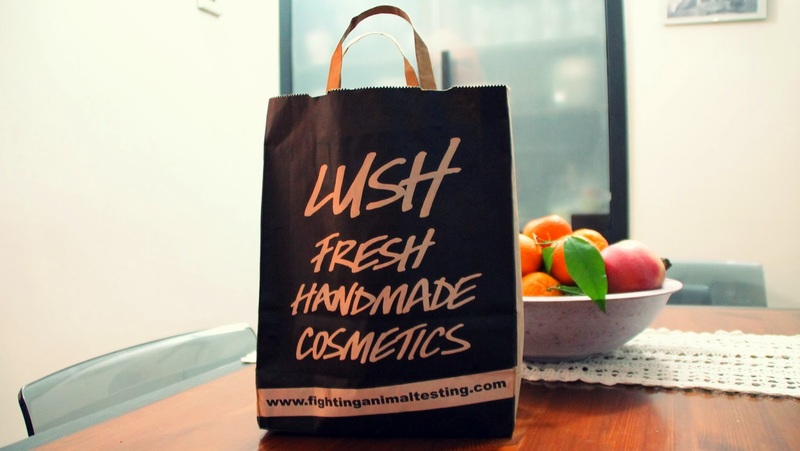 If you don't have one as well, just don't panic: there's a whole amount of Lush amazingness waiting for you in every shop (and in this Haul!). First thing i got is something my lips were asking for a long time. No innuendos needed, It's a lip scrub! At this point I'm really frustrated that the internet does not supply a smelling button. This smells exactly like cola candies. You know, the ones in the shape of a bottle? same smell. The thing is, there's absolutely no cola in it! 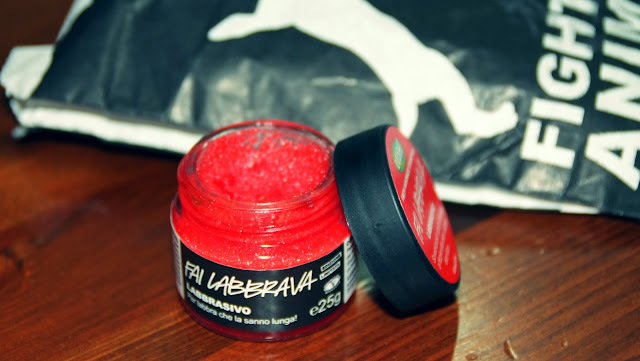 It's a mixture of sugar, fruit and Oils that leave your lips compleately hydrated and soft. 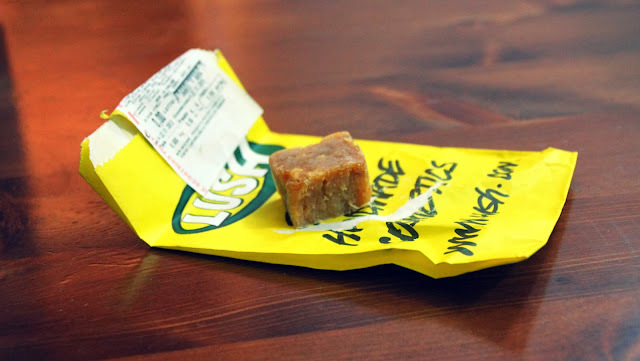 The best thing is that after you take the smallest amount of product with your fingers, and rub it on your lips, you can actually eat the excess. I kinda just wanna eat it all, without even using it. But enough rumbling, it's amazing, really does work, and makes your lips ready for every festive red lipstick. Nb: since the names you'll see in the pics are all Italian, i'll link every product in the UK website! Next, is this Shower exfoliator. Sugar Scrub to be precise. I haven't tryed this yet, so instead of giving you my opinion I'll just tell you what the shop assistant told me; It's an intense Scrub, made out of sugar (hence the name), ginger and fresh fennel to liven up tired skin and sort out any lumpy bumpy bits. What you do with this is you use on hips, bums and areas where you want to wake up your circulation to exfoliate the surface and stimulate the tissues below. I'm very excited to use it, and I'll let you know asap. This one I actually got for my Mum. She wanted to try Lush, and in particular, she told me to buy her a nice body cream. I decided to go for this one, because of its light, delicate scent. It is based on fairtrade organic cocoa butter and almond oil, and is combined with essential oils specially selected for their ability to restore and improve the skin – like tagetes, ylang ylang and geranium. But its amazing smell and consistency is not the best thing about this cream. As you can probably spot on the lid, every single euro (beside taxes) is given to a local charity. It comes in two different sizes, but since it was our first try, we decided to go for the smaller one. Bad move, we'll definitely come back for more. I was lucky enough to receive a couple of free samples. 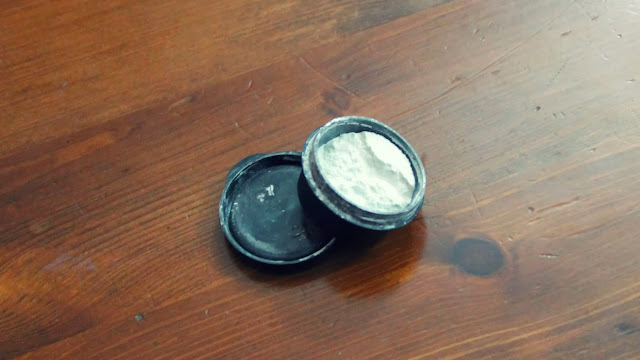 The first one is a small amount of Lush's best seller body and face powder. 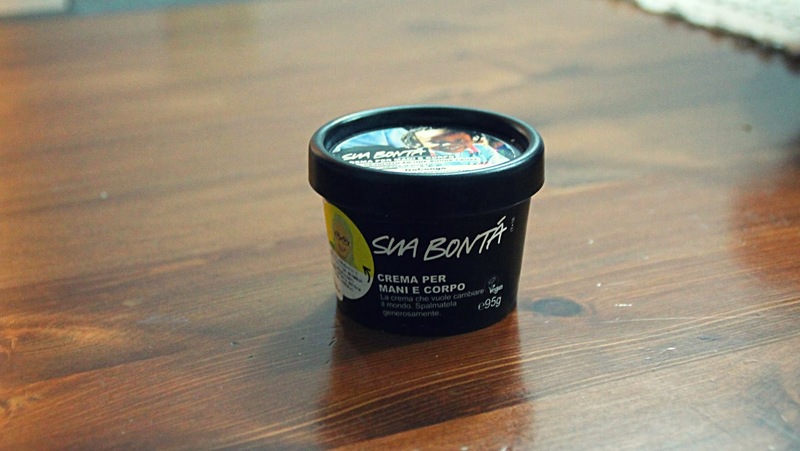 It makes your body smooth and silky and smells of jasmine and cocoa butter. I tell you, this is pure Lush. And last but not least, no Lush Haul would be compleated without a soap. This little one i got is called 'Nove Agrumi e 1\2' and i really don't know where to find it on the UK website. Sorry guys. I'll try to describe it to you: It has such an amazing fresh and energetic scent. It's made out of fresh squeezed Lemons, Limes, oranges and citruses.. all kind of em. It smells like orange squash, and i really really love it. Even if i'm not able to link the exact one, i give you the full selection here: https://www.lush.co.uk/category/255 . I simply love Lush. I love theire green policy, the fact that they're all crazy people, and that everything in the shop is made out of happy fruit, to make everyone happier. 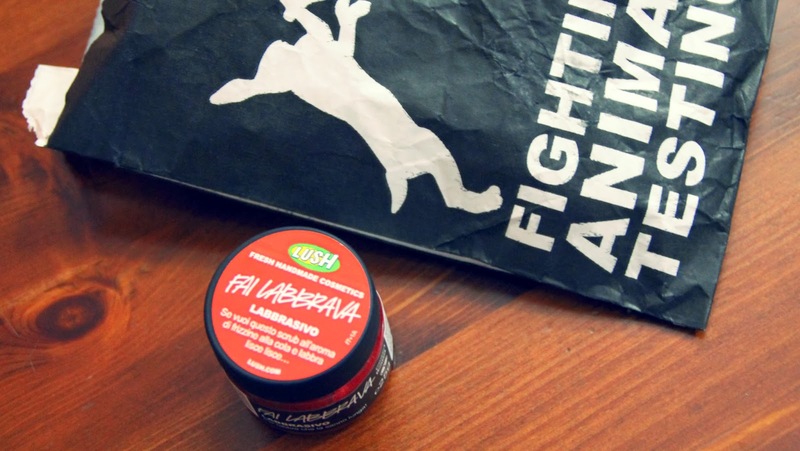 I also totally support the 'Fighting Animal Testing' campaigne they're sponsoring. 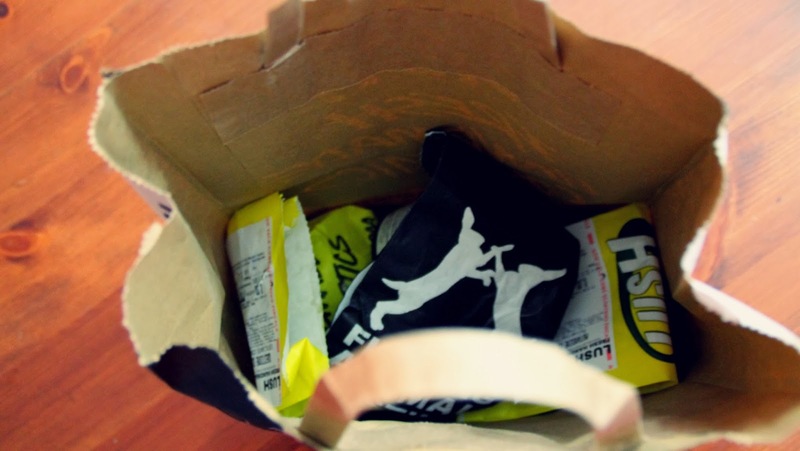 In all honesty, if you ever find a Lush shop along your way, just stop, go in and have a sniff: I guarantee it'll change your mood, and maybe your day. So, that's it for today's post! Hope you liked, and as always I really appreciate your feedback! 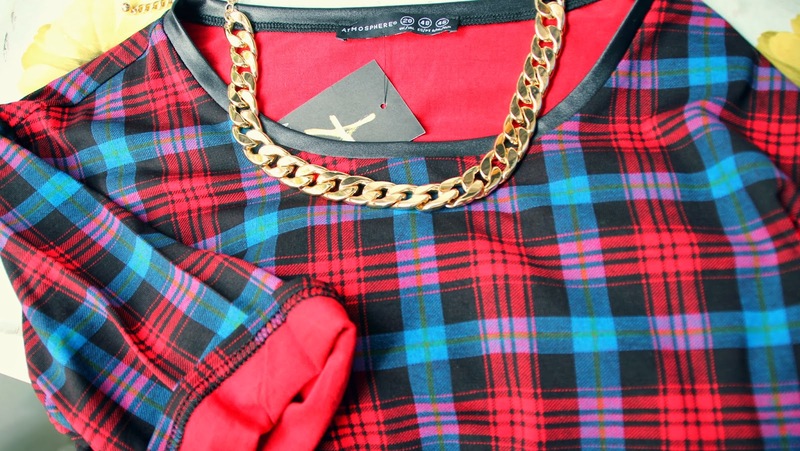 For today's post i've decided to jump in that deep dark rabbit-hole thats Fashion Blogging. Ouch. I'm already regretting it, because although my love for fashion has always been immense and unconditional, i know this is quite a touchy subject. The thing is, that Fashion is based on personal taste (which i do not miss), but also on the opinion of those who count. Trend setters, bloggers,celebs that every now and then decide whats in and what's absolutely drastically out. Now. I tend to follow the trends that i love, that i find appropriate to my personality and to my body shape. This doesn't necessarily mean that what i like is what you like. (Thank God, otherwise the world would be populated of Meg look alikes, and trust me, it'd not be good.). After this (maybe not necessary) rumble, let's introduce today's subject. Since i'm moving my very first baby steps into this mad internet environnement, i've decided to play it quite safe. So i'm not gonna show a whole outfit, nor talk about actual chlotes. Today's all about accessories! I know everyone loves a good necklace to jazz up a simple outfit, or a beanie to keep it trendy and cosy. So, regardless of what is your style, these few accessories will give that something special to your every day fashion choices. 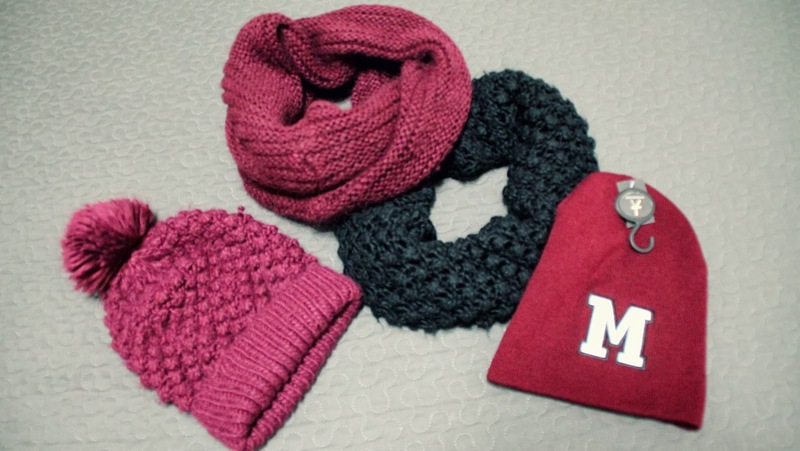 As I said before, i absolutely love the look of beanies on simple oufits. I may be influenced by this whole Cara Delevigne'd type of fashion taste but, I really do think that a nice hat, weather it's a bubble hat or a querky sporty one, gives instant cool to every daytime look. And, nobody likes frozen ears, right? Another absolute staple for the colder months has to be a scarf. Now, i love big, chunky scarves, but i always find annoying the fact that they just don't collaborate.. You know when you're in a rush, crossing the road, with a million bags in your hands, and your marathon is made even more difficult by your scarf dancing with the wind, ending up on the floor? Trust me, there's a remedy for all this pain. It's snoods, infinity scarves however you wanna call them, just get one, and you'll see the magic: the look of a scarf, without the struggle. 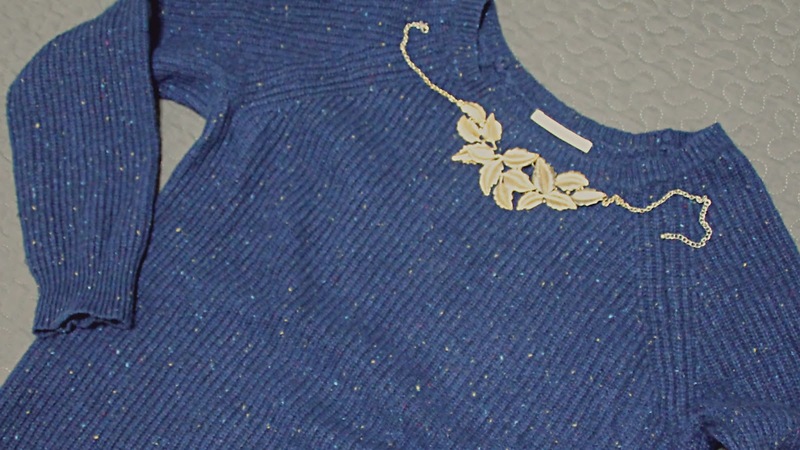 Now, talking about statement necklaces. I know that some of you won't feel the same way as i do, but i adore them. I know some are quite over the top, or might look tacky, but i simply can't get over the way they make every plain top look like it's just been seen on fashion Week. And, finally. To me, shoes are the reason to be. I kid you not, I own so many of them,and i just can't stop buying some new. It may seam cliché, but i'm properly addicted. 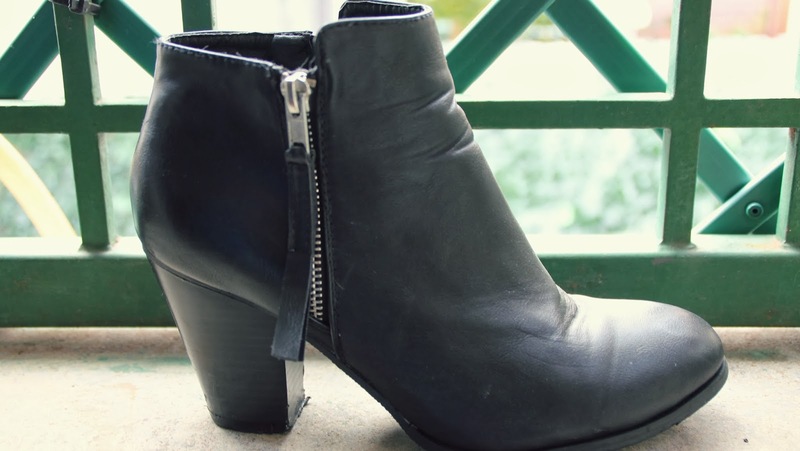 This year's winter selection is Black Boot Based. I always tend to rely on neutrals and darker shades for the colder months, but this year i've especially gone all black (with a hint of white, tartan and maroon), inspired by this whole grungy, rockchick vibe. 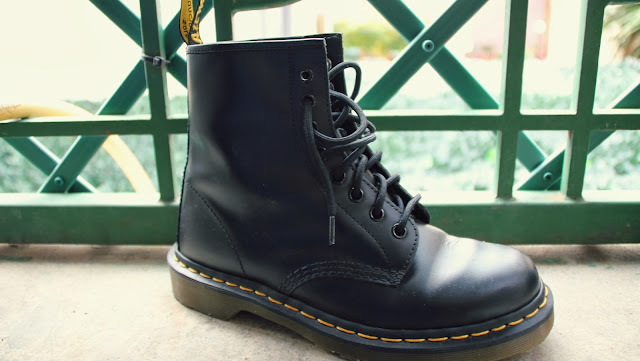 My selection includes three pairs of boots: Chunky and casual Docs (my new addiction, totally worth the pain. No pain, no gain..right? 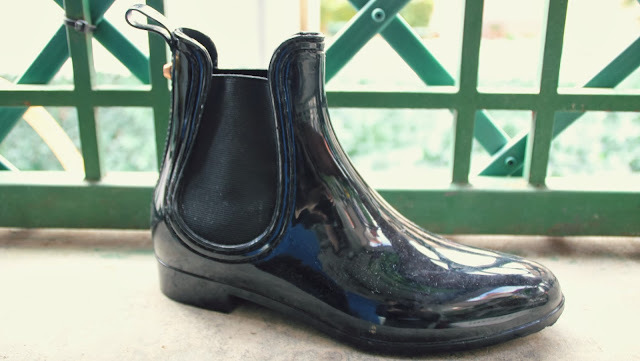 ), Girly Wellington boots for those rainy days, and finally some cool, laid back heeled chelsea boots, just to keep it comfy and stylish. You choose. And that's it for today's blogpost. Ah, I feel relieved now. I'ts been fun, so let me know if i shell go on, into the rubbit hole once again. As always comment, share, follow me on bloglovin and thanks very very much for reading or adding me on Google+ to all of you. It means the world! Hello there lads and ladettes! In a few days i'm allowing myself a little break from university, stress, and tiredness by going on a long week end city break! I'm flying to Berlin, Germany, and I'm beyond excited. That's why I decided that today's post had to be holiday related. I Haven't finished packing up yet, because i'm all about the 'last minute rush' technique,but today I've gone shopping to repurchase some of my favourite bits from the drugstore, mini-sized. As you surely know, if you're flying with some sort of hand luggage, you must not carry with you liquids or fluids cointaining more than 100 ml of product. Instead of putting products in those plain plastic bottles and jars (made exactly for the purpose) that i always end up loosing somewhere and never reusing, I prefer to buy travel size little numbers, so that when they're empty, i can loose them along the way without feeling too guilty. Here's what I got this time. Without going through every single bit, I'm gonna skip the boring ones. Basically I just got Showergel (2 bottles cause they're soo tiny), Pantene Shampoo and Loreal Elvive Colour Vive conditioner. I actually use the full size of this products, you guys know that i luuurve it. And of course, you gotta brush your teeth! Since Germany is a pretty cold place to go in the middle of November, it is very important to be covered; a rich face moisturiser is as important as a padded jacket! For this reason i got Nivea Soft, that has a very rich formula but it's not greasy at all, and one of my ALL times favourite moisturiser (and brand), The Avene Antiredness daily face moisturiser with SPF. Even if it's winter, it is actually very important to put some sort of uv protector on, to avoid any damage. Under my National Geographic Berlin guide, you can spot Amuchina Hand Sanitizer: of coure we're going to be taking public transports, and to be away from our hotel room for a long time, so whenever it's time to use our hands for a quick snack, they need to be cleany clean. Next to it, I know you've spotted my favourite Maybelline Baby Lips in Fresh Mint. It makes my lips super soft, has spf in it, smells of peppermint and the colors of the packaging are super adorable. What else do you need in a lip balm? Those weird white papers in front of my Polaroid camera are some KIKO powdered wipes: they're amazing for a mattifying touch up on the go. One thing that i find really usefull when it comes to hand luggage beauty packaging is using samples. As you can spot from my picture i've got a few; there's every sort of product in those little bags, from hair conditioner to face masks. Moreover, I find that carrying with you a very expensive glass bottle of your favourite fragrance is not the sharpest of moves.. just ask for a sample of your favourite scent to your trusty shop assistant, or if you fancy, trying samples is also a very smart way to find some other scent that you might like! They do not take up any space, and once you've used them you can simply throw them away.. and most of all, they're FREE! Talking about makeup, I have no Idea of what to carry with me.. i always end up packing too much stuff, and then using almost none of it. That is why I haven't featured make up in this post. If you wish, i might do one after i come back, talking about the few things that i really did use and enjoy! That's it for now! As usual hope you like, and I'll talk to ya'll veeery soon! Oh hello there Lads and Ladettes! This week's post has been requested by one of my friends, that's why for the first time ever, i'm embracing Haircare. 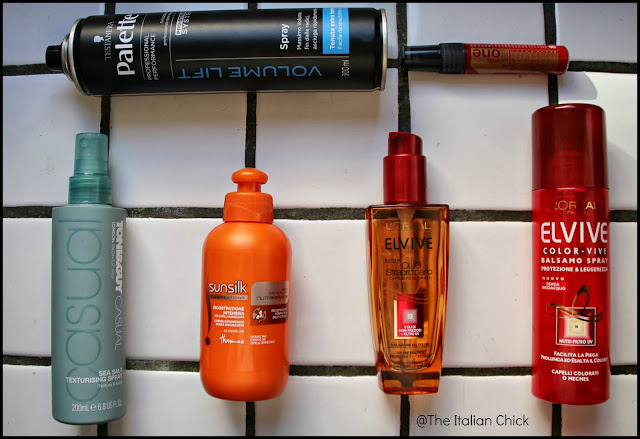 Let's say it straight from the very beginning: I'm not a massive Haircare girl, nor i feel actually prepared to write a post about this subject.. but you know what they say.. bros before nervous (yes i just made it up for you). So, without any further rumbling, these are the products I always treat myself with, with a little bonus for you: They're pretty much all from the drugstore. Loreal Elvive Color-Vive Spray Conditioner: I bought this bad boy when I had my hear bleached, because they were looking horrible, and very very dry. So I used to use my regular conditioner under the shower, and then apply this leave in one on my wet hair just to give it extra moisture. This drugstore spray is especially made for colored or bleached hair. It makes styling easier,makes your hair color really pop, reflects the light, it is really lightweight and it has even an UV filter. Definitely a Winner. Sunsilk Intensive Care for Damaged Hair: This leave in conditioner has the exact same texture as my regular one. This actually kinda scared me when i first saw it, because i thought that it would have made my hair look dirty and greasy. Surprisingly, once you've applyed it, it desolves into your wet hair, and makes them dry really gently leaving them soft and healthy. I started to use it after re-dyeing my hair, to give the a little pumper, and never stopped since then. It really works! Loreal Elvive Extraordinary Oil- Coloured Hair: This drugstore Hair Oil is uberfamous all over the interwebs, and there's a reason. It is very much cheap compared to any other product in this category,nevertheless it feels very luxurious. Even the smell of it reminds me of expensive products ( a little warning for you scent-haters out there! it SMELLS, a lot.) Basically what this bad boy does is, it sublimes your hair colour, it protects it and makes it shine. Moreover, it comes with UV protector. 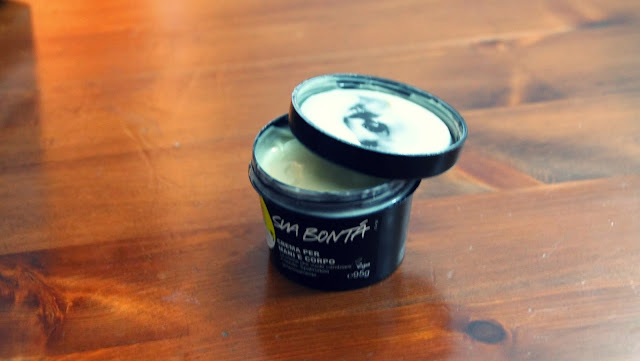 I use it on the ends of my very long hair, to prevent split ends and dryiness. The glass bottle (yes, glass!) contains 100ml of oil, and even if i've been using it for months and months, it still contains the majority of the product. One annoying thing: it does not come with a lid. really? Uniq One, All in One Hair Treatment: Whenever I'm feeling like straightening my hair with tools that involve a lot of heat, I protect them with this hair treatment that works amazingly as a heat protector. My Hairdresser gave it to me, he did good. Schwartzkopf Volume Lift Hairspray: After aalll the former styling process, wether if i'm going for curly or straight hair, the only thing i need is: volume. And this extra strong, lightweight number is very much appropriated. It doesn't glue, doesn't stick, doesn't show..it's perf. And that is it for my (not very professional i'm sorry guys don't judge me) Haircare Routine!